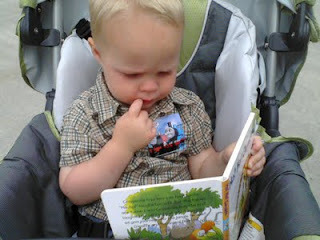 On Saturday, I packed the Kiddo into the car and headed off to my alma mater, BYU, for the Utah Festival of Books. I was excited for books and the people who write them. He was excited to be outside. It was a win-win situation. It was fun and a little surreal to be back on campus again, pushing a stroller. We started off with the kids games. The Kiddo colored a lovely paper hat he refused to wear, and enjoyed watching the people dressed as children's book characters: Madeline, Winnie the Pooh, Clifford the dog, and, um, Darth Vader. Yup, he's the first one I think of when children's books come to mind. He went fishing and got a sticker, and then won a book on the Book Walk. We stood in line for quite a while for James Dashner's signing, but the awesome thing about waiting in lines like that is you meet people who love the books you do. I got my book signed, and to my surprise, James remembered me from BYU's Life, the Universe, and Everything symposium (and from winning one of his signed ARC's of The Scorch Trials-- it helps sometimes to have a weird name!). I, of course, had forgotten my camera, but he was kind enough to post for a cell phone picture. Twice, since I accidentally deleted the first one. I met the awesome Kiersten White, as well, and got Paranormalcy signed. Meeting the authors I admire always gets me a little giddy! It's inspiring to meet the people who write books, just like the rest of us, and have reached those goals I'm still reaching for. It's like a pep talk without the talk. Sadly, I couldn't get a picture with her because my cheapo phone camera doesn't work well outside. I also met this lovely lady in line. 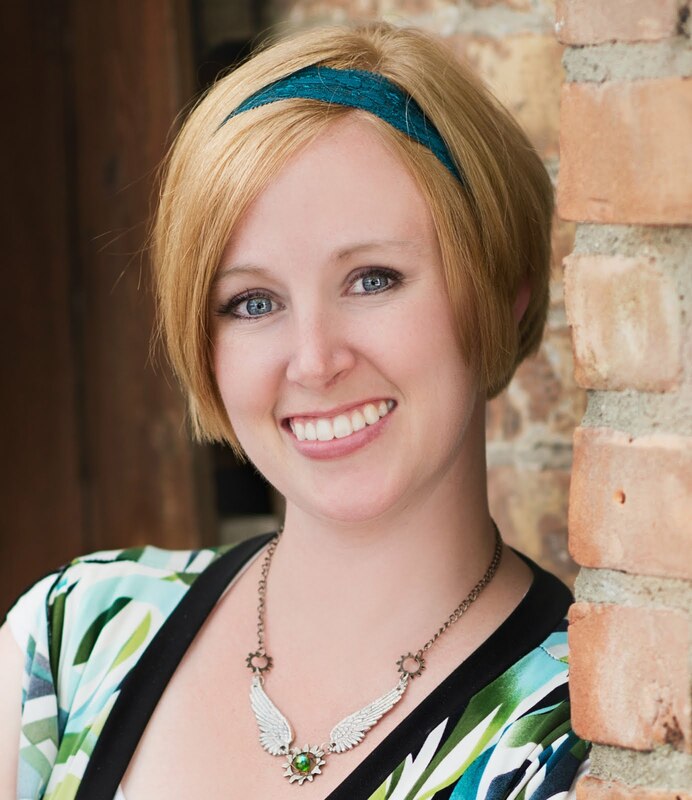 Go check out her fabulous book blog! We got a little lunch at the Scoreboard Grill, bringing back some lovely memories. 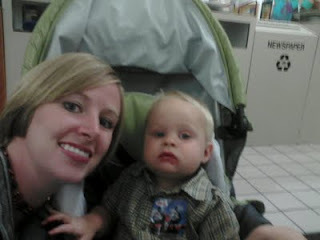 By then, the Kiddo was sick of sitting in the stroller, so I let him run around. 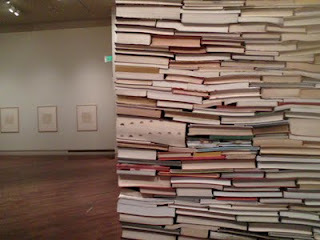 He ended up leading us to the Museum of Art, where we found what I'm fondly calling the Big Block of Books. It's big. It's a block. It's made entirely of books. It was freakin' awesome. And then, home we went. It was an awesome day with just me, the Kiddo, and a whole lot of books. I leave you with this quote from the few minutes of Brandon Mull's presentation I caught: "Just because you grow up doesn't mean you have to break up with your imagination." So, my friends, did you do anything fun this weekend? What is your favorite book-related event you've been to? How Fun! I didn't realize it was a big event, but my sister won an award for some book art she did. 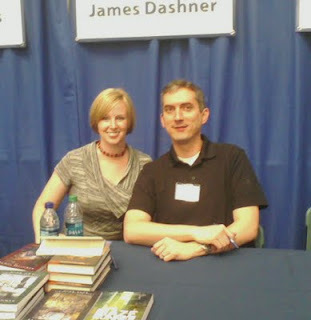 Yay for meeting James Dashner! 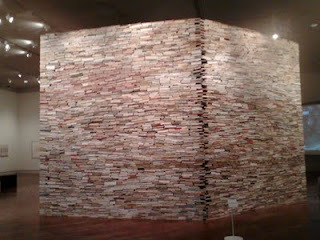 That wall of books looks awesome too - was it actually full of real books? Must have been a huge project. Thanks for sharing your pictures! That sounds like so much fun!! I wish there was something like that around here. Did you cut your hair? It looks great. I love that big block of books! I came about 5pm in the hopes of catching Elana J. I did get to see her, but she was out of books by then. It was fun to talk to her though. That's all I did. Next year, I'll have to bring the kids and spend the day. Uh... That big block of books is AWESOME!! Big block of books = AMAZING! Looks like you guys had a lot of fun! I'm jealous! What a fun way to spend a day. Omg, you cut your hair! Or maybe I've just been out of the loop too long ;p That block of books is AWESOME. 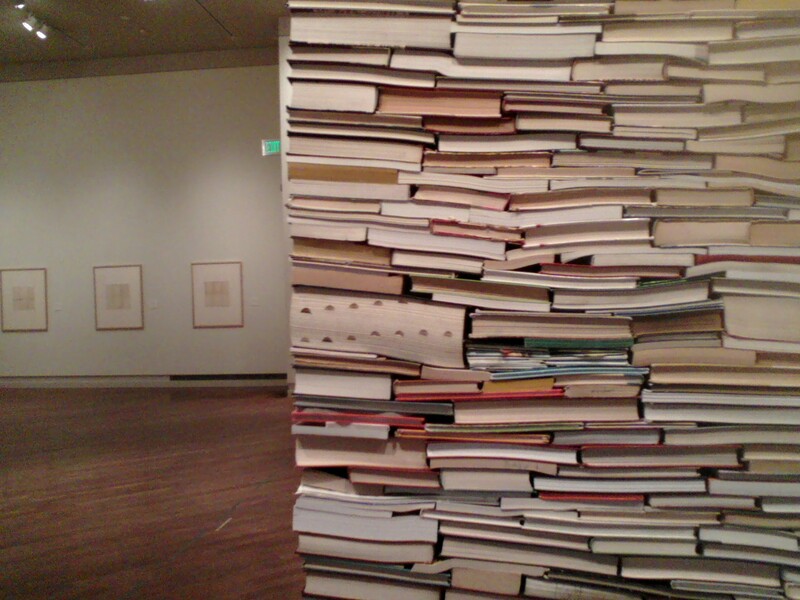 What if a kid pulled out a little book from the side and the whole thing came crashing down? Yeah, i always think about stuff like that ;p Glad you had a fun time, and I would have loved to meet Kiersten White!! James Dashner admired my iPad--the first he'd seen. Anyway--'nough about me. What did you learn at the book fair--any writer-ish tidbits to share? Wow. What a wonderful day you had. It's such a thrill meeting a long admired authors. I've met a few but the one that really sticks out for me is Terry Pratchett. He was funny and sweet. That sounds like an inspirational way to spend your weekend. I wish I could go to book fairs like that. I spent my weekend singing in the choir and putting in long hours to revise my story. Hi Shallee...looks like you and kiddo had a great time.Its always fun to visit one's Alma Mater. Both of you look wonderful. I didn't do much over the weekend, just read a book and visited blogs. That. Is. An. Awesome. Quote! Wow, gonna remember it! Sounds like you had a great day - I felt your enthusiasm. Have to say, that I'm a little bit jealous. (Maybe a lot:) I didn't realize it was a huge event with stuff for kids as well. So cool. The book world is incredible!